Being on vacation is great. Lots of time to finish projects or completely ignore those and start on new ones. Like this handbag for my aunt, which was a Christmas gift. I made a comparable style for my mom many years ago when I was newer to sewing. This one took a lot less time. The best part is that I got to use some of the high quality fabric I scored at the FiDM Scholarship Store at bargain prices. I played with putting on some buttons on the pocket flaps for decoration, but in the end this bag seemed to say to just leave it plain. 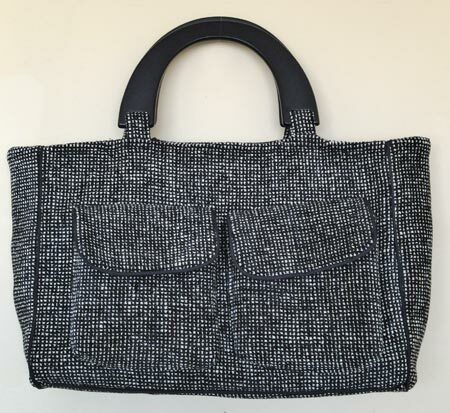 The pattern is adapted from Vogue 8214 and uses a lovely black tweed. If I had more of the fabric and I sewed clothes, this would make a glorious Chanel-like tweed jacket.